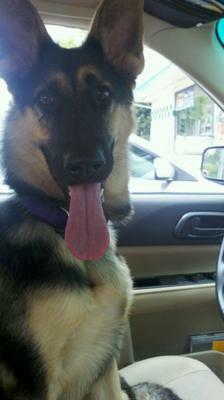 This is a picture of our beautiful Sable waiting for my husband Chris to come out of the store...As soon as he gets out of the car, she hops in the front seat and patiently waits for her Daddy to return..
Sable is a pure bred German Shepherd pup and today (August 5th) marks her 7 month birthday. As seen in this picture, she is full of life. Always on the go. She has a genuine personality that draws people to her, though when its just mom and her out for a walk or at home...her guard is up and she is very protective. Sable is the lady of the house and doesn't let anyone (especially me) forget about that! My husband and I are are so thankful and blessed to have her in our lives, she keeps us active, happy and busy! Sable is a lucky German Shepherd. What a beautiful girl you have. German Shepherds are very protective especially when strangers are around. Take care of your girl and she will take care of you! God Bless German Shepherds!!! Story sounds like my Lady. Take care and give a hug for Me.